I may have mislead you with some of the ingredient names in the video that accompanies my Thank U, Next #easyassheetcake video, and for that I apologize…but you have to admit it was funny. 😛 You can find the real recipe here: One-Bowl Funfetti Sheet Cake. The inspiration for this cake is pretty obvious, but if you’re like my husband and pay zero attention to pop culture, it’s the brag book from the video for Ariana Grande’s song, Thank U, Next. The video is a funny spoof on the movie Mean Girls. Just google it if you haven’t seen it already and you’ll totally get it. 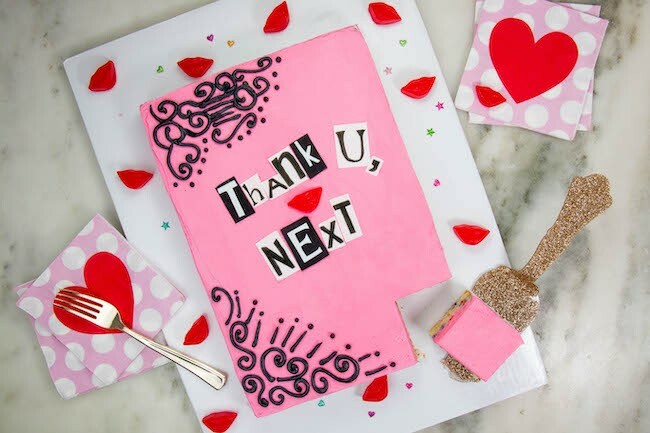 This would be the perfect anti-Valentine’s Day Cake or for a friend who just went through their own version of thank you, next. 1 sheet cake, I used one batch of my One-Bowl Funfetti Cake baked off in my favorite sheet cake pan. Remove about 2 cups of the plain buttercream and set it aside. Remove another cup and tint that small amount black. Add it to a piping bag fitted with a small round tip, set aside. Use an icing spatula to spread the plain buttercream over both short sides and one of the long sides of the cake to mimic the pages of the book. Frost the top and remaining long side of the cake with the pink buttercream. Cut rectangles from both the white and black sugar sheets in varying sizes for each letter. Cut the white letters out of the sugar sheets and draw the black letters with a food coloring pen. I found the black sugar sheets to be much drier than the white sheets. Take your time and use very sharp scissors to make your cuts. I ended up using a food coloring pen to draw the black letters rather then cut them out, because it was easier and there’s no way the brittle sheets would have held up to such narrow cuts. Always keep the unused sheets sealed in the bag while you’re working with smaller pieces. If you didn’t like working with the sugar sheets, you could always use fondant. Arrange the letters on the cake. Adhere the white letters to the black sugar sheet rectangles with a dab of water. Add a pair of gummy lips between the letters and pipe on doodles using the black buttercream. Then move on. He didn’t deserve you anyway. ??‍♀️? I read your article and it is interesting. It looks very yummy. I hope I will make them like you.